The North Carolina Cotton Growers Association was founded as the North Carolina Cotton Growers Co-operative Association in 1922 to help cotton farmers gain greater control over the way their crops were marketed. The association was formed after the state's delegation to the American Cotton Association's convention in Alabama returned with favorable reports of the organizational plans proposed by California lawyer Aaron Sapiro. In 1920 cotton was one of the most important crops in North Carolina, accounting for 25 percent of the state's agricultural acreage and total crop value. When cotton prices dipped after World War I, falling from 40 to 10 cents per pound, North Carolina growers were desperate for some help. Cooperative marketing strategies were seen by many as the only solution to the industry's faltering stability. Through the efforts of B. W. Kilgore, director of the Extension Service of North Carolina State College (later North Carolina State University), and Clarence Poe, editor of the Progressive Farmer and How Farmers Cooperate and Double Profits, and with the cooperation of Governor Cameron Morrison, a coalition of bankers, politicians, cotton farmers, and extension workers incorporated the cooperative on 8 Feb. 1922. The organization began as a means for individual farmers to achieve group bargaining power with textile mills, warehouses, and other markets. This allowed farmers who belonged to the association to work together to negotiate better prices for their crops. In 1964 the organization became the Carolinas Cotton Growers Cooperative; by the early 2000s, it included 1,500 cotton producers from North Carolina, South Carolina, Virginia, and Georgia. The group's mission has grown; the modern-day Carolinas Cotton Growers Cooperative assists planters with all aspects of growing, harvesting, and marketing their cotton crops. In order to help farmers plant and maintain a healthy crop, the cooperative serves as a clearinghouse for information concerning seed, seed treatments, plant growth, weed and pest control, and other related subjects. To assist with the harvest, the cooperative informs farmers of the latest technological advances in tractors, pickers, and other farm equipment. In addition, farmers can also turn to the cooperative for information concerning ginning and warehousing. Most importantly, the cooperative provides farmers with information and advice concerning a variety of marketing options to ensure that farmers get the best price for their crops. 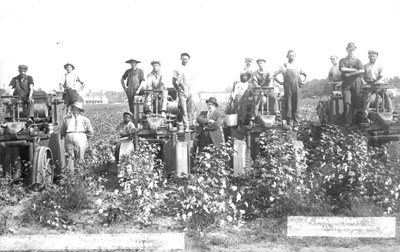 Cotton picking machinery a success; Price Campbell Machines; 2 businessmen and workers pose with 4 machines, near Hamlet, NC, c. 1913; photo by Frank Marchant, Hamlet, NC. From the General Negative Collection, North Carolina State Archives, call #: N_92_7_31, Raleigh, NC. Available from http://www.flickr.com/photos/north-carolina-state-archives/2845641385/ (accessed September 10, 2012). 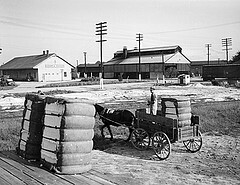 Cotton Gin, Dunn, NC, September 1938. Taken by Baker. From Conservation and Development Department, Travel and Tourism photo files, North Carolina State Archives, call #: ConDev1413A-D. Available from http://www.flickr.com/photos/north-carolina-state-archives/2701391475/ (accessed September 10, 2012). 1 January 2006 | Porter, Matthew C.
I have never seen cotton growing, and it is on my bucket list of things to see and do. I am new to the SE coast of NC, and would like to know if cotton is grown and harvested anywhere near me. You’re post was included on the page for the North Carolina Cotton Growers Association in NCpedia. This page is an article on the association in the NCpedia, the online encyclopedia of North Carolina. We don’t have any specific information on cotton seeds or growing cotton, but I am including the link to the website of the North Carolina Cotton Producers Association, which may be what you were hoping to find -- http://www.nccotton.org/. I hope this helps and please let me know if we can help you locate any additional North Carolina information.